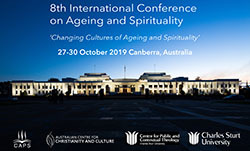 The CSU Australian Centre for Christianity and Culture in Canberra will host an international conference on ageing and spirituality in late October 2019. Research by a CSU PhD student explored the Australian Government’s counter-terrorism policies, and their impact on the Australian Muslim community following international terrorist attacks on and after 11 September 2001 (‘9/11’). The CSU Australian Centre for Christianity and Culture announced the winners of the 2018 Religious Short Film Prize at a special ceremony in Canberra on Wednesday 8 August. The Charles Sturt University (CSU) Australian Centre for Christianity and Culture (ACC&C) will co-host the 4th International Conference on Receptive Ecumenism in Canberra from Monday 6 to Thursday 9 November. The ethical challenges posed by healthcare professionals who wish to be able to refuse to treat patients on the grounds of conscientious objections is the focus of an international conference.